Well, I hate making promises that I can’t keep, so I’m just putting film/ posts where my mouth is. When you shoot film, there is the event of making the images, and then the time when you show the images/ edit/ scan etc. So I’m always in the past no matter when, I share it. Part of it is logistics of getting the film in the hands into the right people, then back to me, and editing and everything. But, I am happy with some images that found their way back from my eye, to my hand, to the film lab, to me, and now to you. From all the instant film craze lately, I decided to go out and shoot some of my remaining New55 PN film stock. It’s been sitting on my shelf for the better part of a year, and I figure I should shoot it before it becomes a paperweight. Recently Famous Format took over the New55 film stock, and have been tweaking the design and slowly building moving forward. See the potential here at Famous Format. I’m hoping to get another box of New fresh film in before Christmas. I found a local bike path that weaves along the edge of a nearby college. I still can’t decide if I enjoy the print or the negative better. To the credit of New55, the Positive and Negative alignment (meaning the image you shoot is the same exposure in negative and positive) are not too far off. The positives don’t have deep blacks, but its a HUGE step up from what Polaroid Type 55 had. You can obviously see that the negative detail is so much clearer than the print, but I still see the two as different parts of the same coin. I do adjust the negative levels in photoshop, but have not touched the print’s scan. It began snowing, and as a Large Format shooter, dealing with wet weather and wooden cameras are not the best mix. 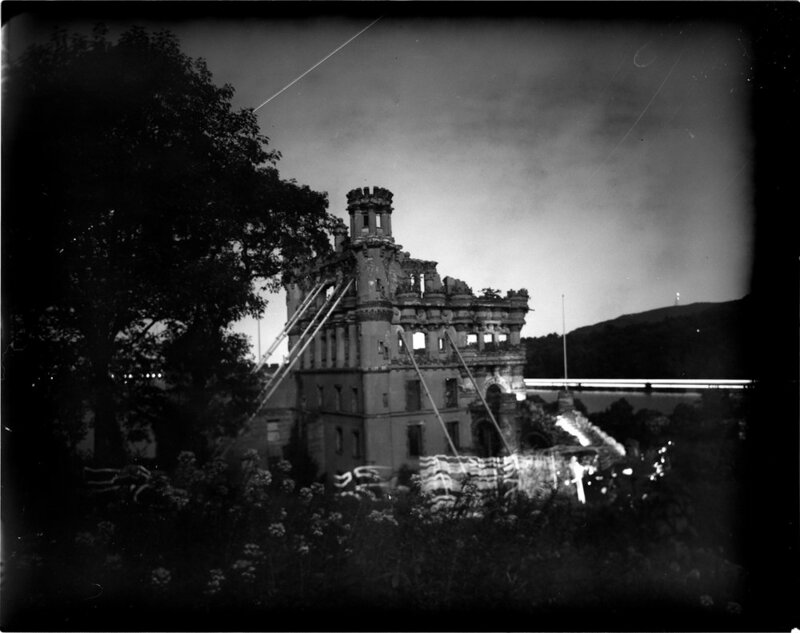 A few weeks ago, I packed up my gear and headed off to an over- Night photography workshop on Bannerman Island. Matt Hill & Gabe Biderman are two awesome people, who happen to love photography, the night sky, and teaching/ sharing their knowledge and skills with others. I've known Matt and Gabe for a while now, but I was happy to catch up with them since I hadn't seen them in quite some time. Instead of making my life easy, and shooting either with a digital camera, or at the very least a film camera, I decided to "restrain myself." By restraining, I decided to Only bring Instant film. Thom Johnson took us over to the Island. His knowledge of the Island was expansive, and he shared a lot with our group. I will not try and reiterate what he mentioned.... basically, this Island is super interesting and has a few walls left of this giant castle that once stood on the Island. Frank Bannerman was the man behind the Army Navy Store. I had to get a daylight shot here and there, or else coming home with nothing would have been a little too much to bare. So the tools I brought over were some Polaroid Type 54, Polaroid 669, A couple boxes of TIP film, and some New55PN. Seeing a castle in the middle of the Hudson is a weird experience, but its pretty cool to be able to photograph it, let alone in the daylight hours. At night, it was a pretty wonderful experience. When I shoot in groups, I always tend to feel a bit of an oddball/ self-conscious. Traditionally, I'm around photographers who are shooting with a digital camera and are figuring out precise calculations to get a perfect image. I on the other hand, shoot from the hip, (sometimes literally) and work with my muscle memory/ intuition on "proper exposure." 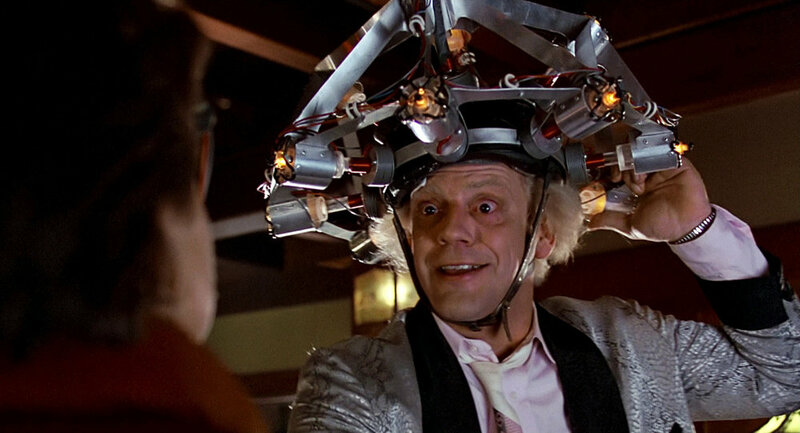 I sorta feel like Doc Brown in Back To The Future running around trying to explain some intangible theory. The New55 Film I recieved just in the nick of time, and I was really excited to use some of their film at night. I've been testing their film at night basically since I've first got my hands on the stuff. The latest iteration film itself has minimal reciprocity failure. I'd chalk it up to ~2 stops difference. Than what my digital camera light meter readings told me. The 669 material quickly showed its weakness. Although during the daylight, the film was working pretty decently, yet at night, the reciprocity failure was too much, it gave me these blocky tones. At the time, I decided to quit while I was ahead, but now that I'm editing them, I like what they're doing creating negative space with the blackness. The Type 54 worked pretty goot when I tested it at home, but in the field, it had similar issues to the 669 when night really hit. I also got some weird fogging issues, but it has its own charactaristics, I guess. One of the most surprising things of the evening was shooting with my newly upgraded/ restored SX-70. Matt over at 2ndShot restored an sx70 I found in Seoul last year. Previously anything shot with Impossible film was crap. Unadulterated poop. This trip has made me change my tune. Sure, the tones aren't perfect, but the film worked. The Impossible Film actually worked! I've always taken the New55 Film PN as two things, kind of like fraternal twins. The positive and negative have similarities, but arent the same. The negative is a tradional negative, but the positive is closer to an alt pro palladium print than a silver print like you'd normally see. The Negative and The Positive. The negative clearly gets more information, but the negative takes on a different charactaristic. The tones change things. Before i begin, I'm not being sponsored or affiliated with either company. New55 PN: The P (Positive/ Print) is what you see on the left. On the Right, is the N (Negative) that I'm then able to scan, print, or do what I'd like to. The aberrations that happen around the edge of the image are a result of how the image is created, and processed. New55Film is a small manufacturing company based out of Ashland, MA. The somewhat foreign process of DTR. This process is the basis for all instant film. New55 is special because they are currently the only 4x5 instant film manufacturer in the world. Realistically, the film is expensive, it has its bugs, and its always disappointing/ frustrating when your images don't turn out. Learning and failing is not a common experience in photography with a digital camera, or even a seasoned film shooter. One piece of advice, is to start out slowly, and realize this isn't your father's instant film. All these examples were created with a fresh batch of New55PN. I'd like to say how easy the material is to use, but to the layman, It's a minefield. I'm making this post to show what an amazing material it is. My previous experience with this film was in a controlled setting has been extensive. I worked for New55 developing, troubleshooting, and testing New55PN in 2015, so Im familiar with the materials. Unfortunately, controlled settings don't warrant the photographs, besides, I was at work. So, my results aren't perfect, but I think they're pretty good. Let me talk about the other side of this post for a second, my camera. I shot all of these images in a Polaroid 545i back on my Intrepid Camera. This camera is amazing, it is the tool that would not grant me the strength to make all these images you see. It weighs ~2 pounds, and I carried this along with everything you see below. Additionally, I had my lens board fabricated out of 3d material. It seemed fitting for the intrepid. I had Randy over at Holgamods help me out. Tape: I tapped over the "Remove after processing, which helped from the sleeve getting caught in the 545i lever. (The one shot that completely failed was as a result of me forgetting to do this) Additionally, remember to take the tape off before you process the film. Remember to bring a dark cloth. This is new film and can't be treated like anything you're used to. Learning involves failure, and I was happy each time anything came up on my Negatives or Positives. I followed these simple steps. The Intrepid Camera Company has been making cameras for a couple years, and I'm happy to be using their system for my Large format shooting endeavors. The camera review will continue as I make future updates with the Color Slide film that was shot in this camera. Not all images were perfect, and I had some fogging issues, and camera issues to be expected while shooting on a new camera. Also, depending on setting your ISO, will determine a denser negative or a denser positive. The alignment of Positive and negative being equal is yet to be realized. Also, the statistics. I shot 20 sheets of New55, and I had 75% success rate. It would have been higher, if I hadn't royally screwed up one image. The yellowing can be avoided by using a clear coat spray to stop the yellowing, but I do like the patina and aged characteristics. This image made me the happiest. It is a successful long exposure. Taking Night photography, and marrying it with New55 was a dream I've had since I started following Bob's experiments in 2009. This image is a testament to how long this project has come. To The future of Analog Photography! This will be the second post in a month I've shown images from my Olympus XA. The XA. Before Korea, I shot a lot of slide film (mostly in large format). So although my collection of film has grown, much of it is slide film. Moving from Boston has presented itself with problems of finding a lab to develop my film. I'm currently in between labs, but am leaning towards Citizens. This roll was shot in Florida when I took a trip out there in the beginning of March. So if you're unfamiliar with Slide film I'll give you a brief explanation why I like it. Typically people shoot negative film to get enlarged and printed. With Slide film, it was originally intended to be put in a carousel and projected onto a wall, and not to be enlarged. Along came digital and changed all that. Now people shoot slide film because the look it gives film. There are a ton of presets in photoshop that people use to make their digital shots emulate slide film. That's not for me. I shoot slide film because of the tones it produces, They are rich, and not exactly contrasty, but the tones are rich. This camera was found by my nearby market while living in Busan. There plenty of markets in Busan, but most of them catered to a typical you market you'd think of, food, clothing, and souvenirs. There was one market (which is still there) off the Dongdaesin station in Busan. If you're ever In Busan, its worth a trip. This market was special because It actually had used/ old/ vintage items such as old north korean money, vinyl, and occasionally film cameras. These photos were all still shot in Busan. I am currently living in NY, but have a massive overflow of images from 2016, so I'll be visually transitioning out of Asia slowly. Everything here was shot on Kodak Gold 200. If you're a shooting film in Korea, go to FotoMaru in Seoul. They were excellent at processing my film and mailing my negatives back to me. I wasn't able to scan at the quality I wanted to until I got home, but I sent them 50+ rolls of 120 and 35mm film with zero problems. They're possibly the best in Korea. My bi- or tri- weekly runs went across this bridge. I really loved running in one straight line and coming back. The Area of Busan i was in was very flat.